This starter kit offers everything you need to ensure that your quaternary ammonium based sanitizer levels are within code. 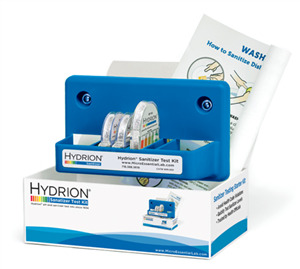 The storage unit mounts above the sink, keeping the test kits within easy reach. The poster serves as a reminder of proper testing procedures. Includes wall mounted unit, 3 Hydrion QT-10 quat test dispensers, mounting hardware and a self adhesive instruction poster.